Advantages: Thorough coverage of this pioneering jet aircraft; many photos including lavish colour section; squadron marking summary included. 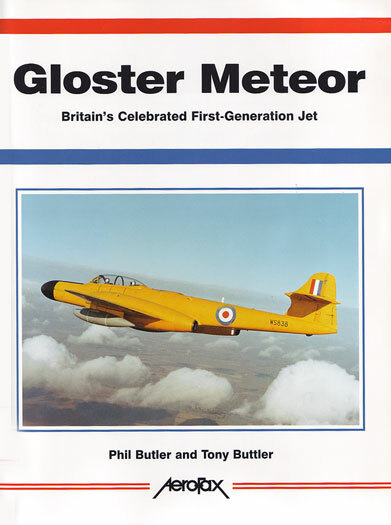 Phil Butler and Tony Buttler have tackled the subject of the Gloster Meteor. The Meteor was a pioneering military jet that successfully performed many roles in RAF and foreign service including day fighter, trainer, night fighter, ground attack, target tug and, late in its career, target drones. A long and distinguished career from the Second World War onward is described by the authors in this newest Aerofax title from Midland Publishing. The book comprises 144 pages plus soft covers. The chapters are logically laid out, starting with a description of the origins of the British jet aircraft in general and the Meteor in particular, followed by prototypes, Day Fighters and Trainers, Night Fighters and Target Tugs, British Service, Foresign Service, Engine Testbeds, Trials Aircraft, Drones and Civilian Meteors and a section inspecting the finer details of the airframe. The main body of the book is generously illustrated by many well-reproduced and intelligently captioned black and white photos. Appendices include a list of Meteor contracts and serial numbers, plsu RAF Meteor Squadrons and other units. This title is nicely rounded out with 27 pages of high quality colour photographs, and several pages of typically colourful Meteor Squadron markings. Aerofax's "Gloster Meteor" will be a welcome and very useful reference title for modellers and British jet aircraft enthusiasts alike.